that he is not getting the best quality of the source signal and he is very likely injecting a great deal of noise into the channel. 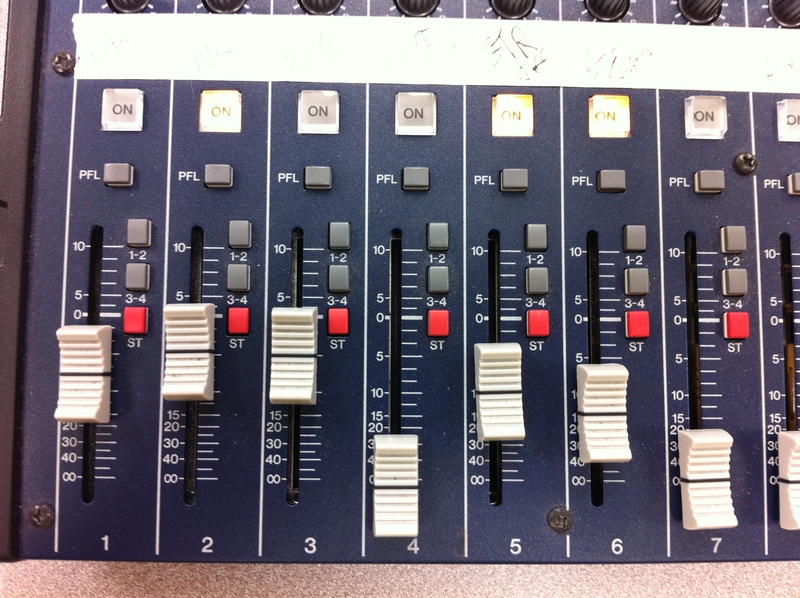 If I see faders scatter about like in Figure 2, I have a much higher level of confidence in how the mixer has been configured. No guarantees, of course, but the odds are in your favor. Why is this? Well, there are two things to consider. First remember that you can think of the signal level as a sort of pressure, for simplicity. Say… water in a pipe. The more water – i.e. signal – you have in that pipe, the more water your valves, baffles etc. have to work on. Conversely, less signal going in means less signal for the board – and any processors. In other words, you will be sending less signal to the compressor, if you have one on the insert. There will be less signal for the EQ to “bite” into in shaping the sound. Less signal to route to the auxiliary buss for other effects or monitors. And if you increase gain on any of the side processors to make up for it, you will also have more noise coming back into the channel. The end result is that you could have less effective compression, over EQ of the signal and extra unwanted noise added to the channel. Wait, though! That’s only half the story. You also need to consider a few facts on the design of a mixer. First, all electronic processing will add noise to the signal. EQ adds noise, Inserts add noise, effects adds noise. You do not want noise added to the signal. Of course, higher quality components and design can reduce the noise added but that gets very expensive very fast. Second, the greatest amount of effort and expense in building the quietest part of the mixer goes into the pre-amp. That’s controlled by the gain knob at the top of the mixer. I’ll say it again. 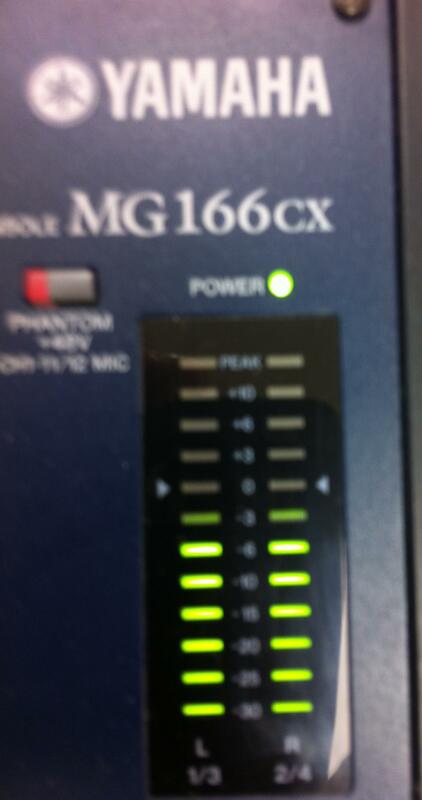 Your gain control is the quietest component on your mixer. And what is the purpose of the gain control? I’ll leave the electronics/physics out of it and keep it practical. The gain control increases the level of the incoming sound so that the rest of the channel as the greatest amount of signal upon which to operate. In other words, but bringing up the signal first through the gain setting, you are providing more signal for the inserts, EQ, effects and whatever else you have interacting with that channel. If they have more signal coming in, then they can give more signal with less added noise coming out. Finally, consider this if you are using the gain control to get the primary amplification of the input. When the signal gets through all the processing and down to the fader, you will not only have less noise, but when you bring the output level up with the fader, you will be amplifying more of the sound that you want and less of the noise from the board or processor electronics. All in all, you will have a quieter, cleaner mix. The reasons may have been a bit geeky to follow, but actually doing it is likely much easier than you think. Most quality mixers have a Pre-Fader Listen (PFL) button on the channel strips and the control panel of most digital interfaces have a similar signal meter that you can use to check the input levels of the incoming signal. All you need to do is set the PFL or open the control panel for the digital interface. 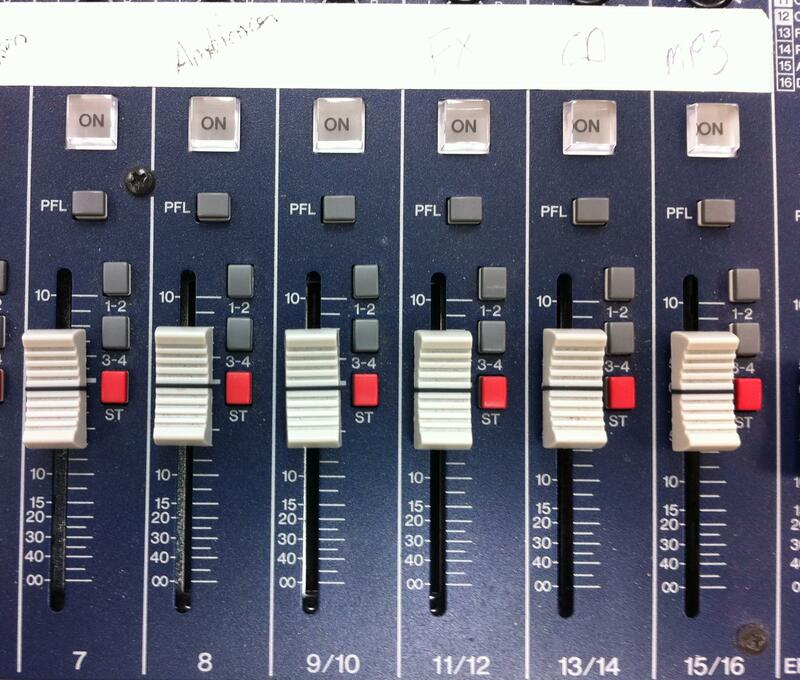 You want the channel on, but the fader down, though some boards may not pass the signal if this is the case. If so, set the fader to 0dB, but know you will most likely have to back it off for actual use. Make sure any compressors, effects or EQ is off. Also you want probably want to mute the output to the speakers for the initial part. This will decrease the chance of feedback while getting things set up. Have the player/speaker/singer play/speak/sing at performance levels. If you have the output to speakers or monitor off, you may want to warn them they won’t hear anything. 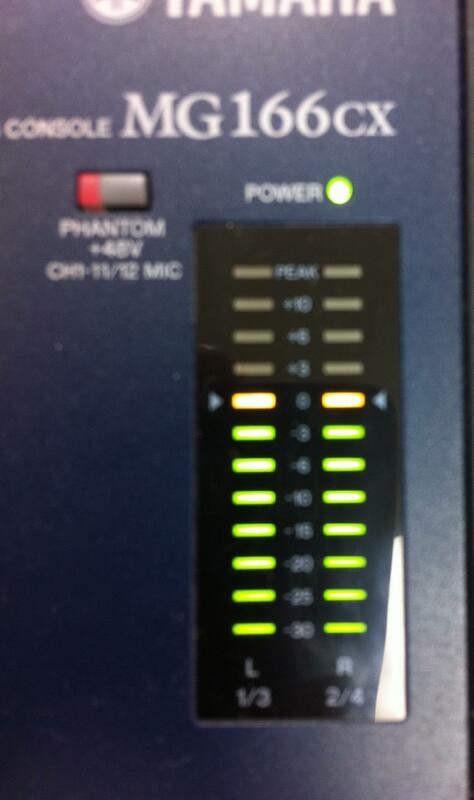 Now bring up the gain up until the meters is hitting 0dB at the louder parts of the performance. This looks like what you see in Figure 3. If you don’t have a PFL, you probably have a single LED signal light that shows green or red when it is getting a nominal signal. In this case, bring the gain up until the LED lights, then back off a bit so that it flickers when signal is present. You can un-mute the channel, set the stereo assign, bring up the main fader, whatever your particular system requires to get sound out of the PA. Now bring the fader up slowly to get the level you want for that performer on that channel. Don’t expect the fader to be up to that 0dB nominal level, but it does happen. Notice the difference? And you haven’t even EQ’d or done any side processing yet. Speaking of which, now is the time to set that EQ and side processing. Be careful, because if you haven’t been setting gain this way before, you may find that it takes less to get the desired result. Now you can repeat this for each of the other channels you are using. There are a few caveats that need to be brought up. First, trust you ears. Lights and meters will only take you so far. If something really just does not sound right, then don’t do it. Second, as a rule, once you’ve set the gain, keep the hands off. Any adjustments to the gain will affect everything downsteam of it. That means EQ, effects, monitors; everything. Adjust the levels using your faders. Whether they are the slider, rotary or digital on-screen variety, that is what they are there for. Next, if you have more than just a handful of channels open at any one time, you will probably want to back down the gain just a bit (Figure 4). The multiple channels do add together and you really don’t want to have too hot a signal. An occasional clip is fine, but constant clipping is not good. Unless you are digital. And that is the final caveat. In the digital world you never want to clip. Clipping in a digital environment equates to crackle and/or no signal. When recording into a digital domain, you don’t need as much input gain at the recording stage as you may think. Let’s use Audacity for an example. Whether I’m going from an external mixer into Audacity or taking a USB mic directly in, the input level I’ve found works best is the range where the signal meter just crosses from green into yellow up to a solid yellow. Generally, I don’t let sound check level ride in the red. That “red zone” is your safety margin to keep you from clipping during the actual recording. Also don’t be surprised if the waveform display in Audacity is not a big as you may have seen before. Go back to my first caveat — use your ears and listen. You may be surprised. You may also be pleasantly surprised to find that you have less clipping/saturation problems in your post-processing if you take this approach. Finally, I cannot stress enough the need for you to test. Do not take this article as law. They are guidelines. Though it will likely be an improvement over a poorly configured board, at best, they will get you only close to what you want. Your ears will always have to be your final guide and you will have to experiment to get just the sound you want. Good luck and please let me know how this works for you.